The U.S. Department of Energy (DOE) released a handbook on the smart grid in 2009, and in the first few pages, made a distinction between a “smarter grid” and a “smart grid.” By this reasoning, the former is achievable with today’s technologies, while the latter is more of a vision of what will be achievable as a myriad of technologies come on line and as multiple transformations reengineer the current grid. The DOE vision for a smart grid uses these adjectives: intelligent, efficient, accommodating, motivating, opportunistic, quality-focused, resilient, and green. In effect, all definitions of the smart grid, envision some future state with certain defined qualities. So for purposes of discussion and clarity, we have adopted a convention for this book in which we refer to smart grids today as first generation smart grids, or Smart Grid 1.0, if you will. Our vision for the future we define as second generation smart grids, or Smart Grid 2.0, or as in the title of this book, we simply refer to the advanced smart grid. And at the end of this book, we envision a future where the smart grid has evolved to an even more advanced state, which we call Smart Grid 3.0. We use a key distinguishing feature to mark the difference between smart grids as they’re envisioned today and how they will evolve as experience is gained and a more expansive vision—our more expansive vision, we hope—is adopted. The difference, while it may seem trivial at first, is fundamental, and that has to do with the starting point for the smart grid project. If the project starts off with an application then that smart grid by our definition must be a Smart Grid 1.0 project. If on the other hand, the starting point is a deliberate architecture, design and integrated IP network(s) that supports any application choice, then it is a Smart Grid 2.0, or an advanced smart grid project. Nearly all smart grid projects today start with a compelling application, whether generation automation (e.g., distributed control systems), substation automation (e.g., SCADA/EMS), distribution automation (e.g., distribution management system, outage management system, or geospatial information system), demand response, or meter automation, and then design a dedicated communication network that is capable of supporting the functionality of each stand-alone application. Evolved from the silos of the current utility ecosystem (i.e., generation, transmission, distribution, metering, and retail services), the first generation smart grid carries with it a significant level of complexity, often perceived as a natural aspect of a smart grid project. In fact, a considerable amount of the complexity and cost of a first generation smart grid project derives from its application-layer orientation. Starting at Layer 7 of the OSI Stack, the application layer—regardless of the application—requires complex integration projects to enable grid interoperability, from the start of the smart grid project onward into the future. As additional applications and devices are added to the smart grid, whether as part of the original deployment or subsequently and over time, the evolving smart grid must be integrated to ensure system interoperability and sustained grid operations. In short, starting with the application brings greater complexity, which comes at the expense of long-term grid optimization. The advanced smart grid perspective begins with a basic tenet. At its core, a smart grid transition is about managing and monitoring applications and devices by leveraging information to gain efficiency for short-term and long-term financial, environmental, and societal benefits. For a system architecture whose principal goal is to leverage information on behalf of customer outcomes, it makes better sense to start with use cases, define necessary processes, choose application requirements, optimize data management and communication designs, and then make infrastructure decisions. A primary focus on the appropriate design process ensures that the system will do what it is meant to do. This key insight—starting at the network layers rather than the application layer—produces the appropriate architecture and design, and drives incredible benefits measured not only in hard cost benefits, but also in soft strategic and operational benefits. Network-layer change stresses investment in a future-proof architecture and network that will be able to accomplish not only the defined goals of the present and near-term future, but also the undefined but likely expansive needs of a dynamic digital future, replete with emerging innovative applications and equipment. A well-informed design and resilient integrated IP network foundation puts the utility in a position of strength, able to choose from best-of-breed solutions as they emerge, adapting the network to new purposes and functionality, consistently driving costs out by leveraging information in new ways. The advanced smart grid is foundational; we go so far as to say that its emergence is inevitable. The advanced smart grid is bound to emerge for two principal reasons. First, electricity is an essential component of modern life, without which we revert to life as it was in the mid-nineteenth century. The loss of electrical power, even for just a few hours, is the ultimate disruption to the way we live. We simply cannot live as a modern society without electricity. And second, at its core, technological progress is all about individual empowerment. But only recently have advances in component miniaturization, computers, software, networking, and device power management technology and the standards that drive their pace of innovation combined to enable individual empowerment in the electric utility industry. A new distributed grid architecture is beginning to emerge that will not only ensure future reliability, but also empower individuals in new ways. Networks and individual empowerment define twenty-first century technology. It is inevitable that the design of advanced smart grids will begin with a network orientation that is able to accommodate any and all network devices and applications that will emerge in the future. It is also inevitable that advanced smart grids will evolve to ensure an abundant and sustainable supply of electricity and to empower individuals to manage their own production, distribution, and consumption of this essential commodity. The advanced smart grid must be robust, flexible, and adaptable, so it will be; as projects move along the learning curve, society who will insist on an advanced smart grid. 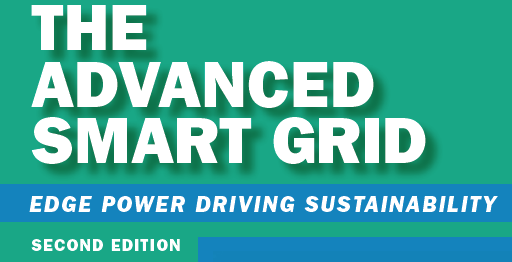 An excerpt from The Advanced Smart Grid: Edge Power Driving Sustainability by Andres Carvallo and John Cooper © 2011 Artech House, Inc. Reprinted with permission of the publisher. The book is available at www.ArtechHouse.com. The process involved in deploying an advanced smart grid is noteworthy in three key areas. First, the utility pursues access to an IP network architecture capable of supporting all of its communication and application needs going forward. In this build versus buy decision, the utility has three options: build and own a network or networks, lease space on a commercial network or networks, or the third choice and probably the most likely: choose a hybrid of the two. Second, the utility leverages a smart grid optimization engine that enables it to avoid the multiple integration projects required in the first generation approach above while building the advanced smart grid, but also to do much more. The smart grid optimization engine provides dynamic balancing of volt/VAR levels based on real-time data inputs from a multitude of devices. But the smart grid optimization engine also provides the ability to control the devices and the grid in real time. The smart grid optimization engine anticipates a much more complex environment, where two-way power flow occurs as the norm rather than the exception. Finally, the utility leverages standards-based digital devices in the field, substituting for proprietary devices that it had previously relied on. Why are a new architecture and smart grid optimization engine needed for the advanced smart grid? In order to manage complex and growing databases, more and more granular decision making is required to use that data, so utility managers need an architecture that provides access to a universal set of timely data, and visibility of system operations of the entire organization. Accuracy and timeliness depend not just on which database the data is drawn from, but when that database was refreshed and so on. Without such a management system, utility management has what one utility executive has described as “ten thousand versions of the truth.” At any particular point in time, a utility manager in an energy control center must ask, “What is real, right now?” With inadequate, incomplete, and/or out-of-date information, the definition of reality becomes skewed and highly subjective. At a minimum, management decisions that rely on a subjective interpretation of reality lose effectiveness, with risks escalating from there. Utilities today have a fragmented view of operations derived from the silos approach and dependence on proprietary technologies that lack the ability to communicate with each other. Beyond operations, the fragmented view impacts utility system planning as well. At the beginning of each week, electric utility managers design on paper an electric network model based on anticipated conditions, which describes the current status of all the systems that comprise the distribution grid, but the planned design they envision is not maintained throughout the week. In fact, walking through an energy control center today would show multiple operational units monitoring and managing different parts of the grid, from DCS to EMS/SCADA to OMS to AMI to DR, each with a distinct view of the state of the grid provided by the stand-alone proprietary systems. It is left to the human grid operators in the control center to integrate these disparate views of the grid and make management decisions with the information they have at hand. A smart grid optimization engine, as described above, becomes an essential component of the advanced smart grid. Let us explore in more detail the features of this new visionary tool. First, a smart grid optimization engine would need to provide universal management functionality; it should be capable of running on any conceivable IP network (i.e., wired networks such as fiber and Ethernet, or wireless networks such as 3G, Wi-Fi, WiMAX, or LTE). Second, it is critical that the smart grid optimization engine provide complete security that is NIST, NERC CIP, and FIPS compliant; it should support end-to-end security, from the devices at one end, on through the software running on the devices, to the network transporting the data, down to the databases hosting the data, and to the utility NOC presenting the data. Third, the smart grid optimization engine should be capable of operating at near real-time speeds—at 100 milliseconds or less—and be able to fully support Internet Protocol (IP). Instant communication will be needed to support the functionality of an advanced smart grid. Fourth, a smart grid optimization engine should provide superb interoperability; it should be able to support all electric devices (e.g., transformers, feeders, switches, capacitor banks, meters, inverters) from any vendor, because utilities are unlikely to settle for a reduced set of options when it comes to finding the right devices and applications to run their grids. Fifth, a smart grid optimization engine should be capable of growing to meet future needs. Such massive scalability will be needed—when the distributed energy resources now under development become commercially viable and begin deployment, millions of new devices will come under utility management purview. Finally, the smart grid optimization engine deployed to run the advanced smart grid must not only be affordable, it has to be economically competitive on a total cost of ownership basis: it must be more affordable than a dedicated multi-network solution it intends to replace and offer the lowest total cost of ownership (TCO). Beyond features, what benefits would be expected to derive from such a smart grid optimization engine? First, the smart grid optimization engine would be expected to provide enhanced energy efficiency, not only improving distribution grid reliability and power quality but also reducing distribution line losses. Second, the smart grid optimization engine would certainly provide improved operational efficiency, based on new capabilities such as real-time monitoring and control at the NOC level, self-healing network functionality on the grid, and adaptive distribution feeders managing the distribution circuits all over the utility service territory. Third, the smart grid optimization engine would offer greater customer satisfaction, as proactive outage and restoration services were enacted, as enhanced energy products and services were made available, and as retail energy products were bundled based on targeted customer needs. Fourth, the smart grid optimization engine would contribute mightily to societal and utility goals for a gentler utility environmental impact, whether from reduced or sequestered CO2 emissions, better use of existing infrastructure, closed fossil fuel plants, or from leadership in meeting regulatory requirements. Finally, the smart grid optimization engine would provide tremendous economic benefit, as it reduced capital and operating budgets based on its more effective use of system inputs and infrastructure. Electrical energy storage at utility scale remains both the Holy Grail for electric industry redesign and one of the most vexing energy technology challenges. Storage applications may include: peak shaving (load leveling) systems to help commercial and industrial users manage electricity costs under variable utility tariffs and to help utilities manage generating assets to minimize waste; renewable integration systems to help power producers, utilities, and end users cope with the inherent variability of wind and solar power, transforming it into firm, dispatchable power, and to better match peak wind and solar output with peak demand; power quality systems to protect commercial and industrial users from interruptions that cost an estimated $75–200 billion per year in lost time, lost commerce, and damage to equipment; and transmission and distribution support systems to help utilities reduce grid congestion, defer upgrades, and minimize waste. Because utilities still depend on spinning reserve and other supply-side strategies to ensure reliability—and even do long-term planning on the assumption that energy storage will not be viable in the foreseeable future—adding energy storage into the system will significantly disrupt the current energy ecosystem. Implementing an advanced smart grid will help utilities to develop a vision based on the potential of affordable energy storage, where they will move from R&D to active trials of various technologies in different parts of their service territory. The use of energy storage does not need to concern any loss of comfort or convenience, but rather to accept some minor sharing of the resource in a collective strategy to pull in a new resource that has never existed before. An advanced smart grid will enable solutions that leverage distributed energy resources, tapping into some that haven’t yet been conceived. Integration with other assets, including distributed generation, demand response, electric vehicles (EVs), virtual power plants (VPPs), micro-grids, and utility-side smart grid technologies will be vital to maximizing the value of each individual new resource, but also of the collective advanced smart grid. With a network and smart grid optimization engine, all these distributed elements can be optimized and their potential realized. Challenges in creating a utility energy storage program from a strategic perspective will include not only energy storage integration, but also designing the system and prioritizing energy storage locations. Energy storage is likely to be located where there is congestion on the grid. The role of energy storage in a disaster recovery situation will need to be considered. Energy storage will be valuable in restoration of electricity service after a massive outage. Prioritizing distributed generation and energy storage for disaster shelters will buy utilities time, since there will be a minimal amount of power assured in those spots in the case of a prolonged outage. Co-location of distributed generation (DG) and energy storage (ES) with disaster shelters supports utility goals in a disaster recovery plan. VPPs describe a demand-side alternative to accommodate growth in peak demand to the traditional supply-side alternative of adding a natural gas power plant, commonly referred to as a peaking unit or a peaker. At the micro level, VPPs require technology to be refined at the scale of a single distribution feeder or neighborhood. At the macro level, integrating a VPP system to the grid will require the ability to manage new levels of complexity in remote sensing, control, and dispatch. Integration of the complex VPP systems will require the utility control center to be able to “see” the status and availability of such distributed capacity. The complexity of system dispatch with these types of resources will require automated decision-making to signal a direct load curtailment condition to DR resources to make optimal use of these new resources and integrate into the larger system portfolio. New control software now available in the market is designed to enable utilities to manage the numerous and complex dispatch requirements of such distributed energy resources as VPPs. Intelligent edge devices such as smart meters, smart routers, and smart inverters are now capable of communicating their operational status, calculating the ramifications of their actions on their surrounding environment, and making decisions to change their state in real time so that the network becomes self-healing and self-adapting. Autonomous, edge-based decision-making maintains safe energy flows, minimizes service disruptions, and, perhaps most importantly, helps to avoid catastrophic damage. Such a distributed network of smart devices connected to VPPs will provide them the intelligence they need to create new demand action capabilities that integrate new edge-based resources seamlessly with the advanced smart grid. VPPs and micro-grids represent an emerging resource and application of creative bundling of multiple technologies. New concepts and thinking about how a grid works will be needed for these approaches to take hold. For instance, while initial adopters of these solutions may have off-grid operations in mind, which we call Step 1 or “disconnect”), the actual realization of these concepts will be difficult. Step 2 could be called “independent operation,” and it will borrow from our knowledge of how we operate the grid today and concepts in this book about future operational protocols. Step 3 is likely to concern the previous discussion on resource islanding, with a focus on “reconnection for reliability.” Step 4, which we could call “replacement,” will finally be realized as NFTE is implemented as policy. As VPPs and micro-grids mature, they will become the LANs and WANs in the Smart Grid 3.0 world, connected by an energy Internet and offering new levels of independence and interdependence that we have barely contemplated today. Where the early grid developers embraced access to cheap, plentiful fossil fuels like coal, petroleum, and natural gas, building ever larger, more efficient coal-fired power plants, today we’re challenged to avoid the carbon that results from burning fossil fuels. Where grid resources on the supply side expanded to meet a growing population and increasing use of electricity, today we’re challenged to involve consumers to avoid peak load by making better use of existing and new types of distributed energy resources. Where production and distribution of electricity were central to planning and building the grid, today we also focus on our built infrastructure to use energy more efficiently and to better understand energy consumption behavior patterns. Using cost plus ratemaking to establish revenue targets for regulated utilities, the keystone of the twentieth-century “regulatory compact” that allowed monopoly franchises is giving way today to considerations of ecosystem impacts, decoupling, and more frequent true ups to meet the needs of society and a variety of stakeholders in a more dynamic environment. When information used to be scarce and expensive, utilities devised ingenious, artful methods to plan and operate the complex grid, but in today’s environment of abundant, low-cost information, we are challenged to add sensors to gather ever more data, and then use data analytics to plan, operate, and manage complexity. Late in the twentieth century, retail competition showed faltering progress and potential, and while markets still have a prominent role to play, in the twenty-first century communities out on the edge will leverage social networking, smart mobile devices, and other lessons learned from the Internet to identify and deliver greater value. Finally, where automated meter reading (AMR) evolved into advanced metering infrastructure (AMI) and led the charge to deliver a smart grid, in the twenty-first century we will need a more expansive definition of smart grid, based on a new smart grid architecture to incorporate edge power by design, which we call the advanced smart grid.